Bailout agreement for Cyprus will close their largest bank and seize deposits greater than €100,000. Without the bailout it might have been the first country forced out of the Eurozone. No one wants to be first, you know. The good news is the Dow Jones is back to what it was before the financial crisis. The bad news is that the value of the dollar relative to gold has fallen faster than the improvement in the Dow. While the U.S. government looks for ways to restrict gun ownership in “the land of the free”, the CIA is busy shipping thousands of tons of military equipment to rebels in Syria. Because the U.S. unequivocally supports the right of people to rebel against tyranny (except in cases where the tyrants are friendly to the U.S.). The military is asking Congress for money to expand the prison at Guantánamo Bay, Cuba. The want $50M for a new building to house special prisoners. This would bring the total bill for upgrading the prison to $195M. So much for Colorado’s plan to treat marijuana like alcohol. And that’s not to suggest that alcohol regulation is exactly a great example of government restraint. The real mistake was letting government think it had the power to control either one. The costs of war don’t end when the war ends. 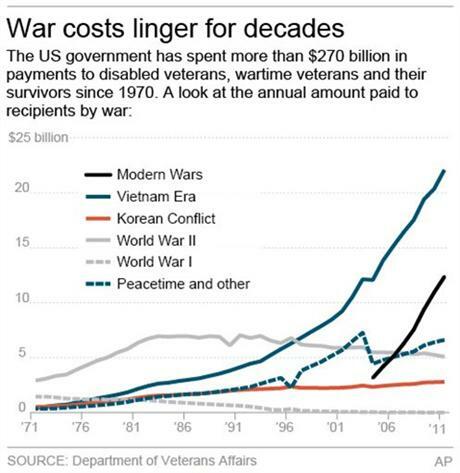 We’re still paying beneficiaries from 19th century wars and billions for 20th century wars. And the costs of recent wars in Iraq and Afghanistan are rising. This entry was posted in Assorted Links, Drug War, Euro Crisis, Federal Reserve, Foreign Policy, Gun Control, The Land of the Free, War Mongering on March 25, 2013 by Dave Krueger.